With the Continuous advancements within the technological sector, a new way has been paved in medical technology following the creation of a more contemporary and a convenient method of measuring Blood Pressure via Wrist Blood Pressure Monitors. Sudden changes in Blood level pressures within the US population increases the risk of strokes and other heart conditions, a few of the leading causes of deaths in America. Hence Blood pressure monitors especially the newly developed Wrist Blood Pressure Monitors substantially contribute to one’s health since they are user-friendly, less time consuming and aid with taking the correct steps needed for controlling blood pressure better. All wrist Blood Monitors, however, must be used by their proper guidance/Instructions due to being extremely sensitive to body positioning. Errors of such sort can jeopardize the accuracy of the end results. 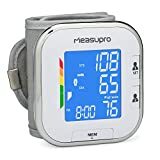 The MeasuPro Portable Wrist Blood Pressure Monitor is as user-friendly as any Wrist Blood Pressure Monitor can get due to its inbuilt one-step measuring technique which not only takes into the record the estimated Blood Pressure but also the Pulse Rate. This simple-to-use device allows two different users to record input with a total of 60 readings per user; one could share this device with another family member or even a friend with its individual easy access buttons. Every three days, MeasuPro Wrist Blood Pressure calculates the average of the previous three readings of its users along with their time, their date in an attempt to notify its users of any progress or deterioration in their well-being. The MeasuPro also features a large backlit LCD screen displaying results of Systolic and Diastolic Blood Pressure. It also includes a range of color variations and a color coded bar to show Blood Pressure levels as well as Hypertensions. Designed upon the foundation of convenience, the product itself comes along with a sturdy carry bag for easy storage and transportation, 2x AAA Batteries for continuous usage and a detailed user manual for obtaining reliable readings. The FDA approved, LotFancy Automatic Digital Wrist Blood Pressure Monitor comprises of an automatic pressurization to ensure efficiency measuring the user’s Blood Pressure ranging from 30~280 mmHg along with a Pulse Rate variation from 40 to 199 beats/min. It is modeled in a manner to sustain even in altering temperatures ranging from 50 °F up to 104 °F with durability even in relative humidity up to 85%. The LotFancy Automatic Digital Wrist Blood Pressure Monitor Displays Systolic, Diastolic, and Heart pulse rate readings, also with an average of the user’s previous three readings. A Blood Pressure classification indicator shows when an individual may or may not be under threat in accordance to the readings being measured. Do not use the monitor for readings when you want to discharge urine. Avoid certain things such as medications, bathing, smoking, having alcohol, eating at least 30 minutes before measuring the Blood Pressure. Rest your arm on a table making sure that it is approximately at heart level for the reading. Stay in a seated position for about 5-10 minutes before taking a reading. Considered as the No. 1 recommended brand by doctors and Pharmacists comes the Omron BP652N 7 Series Wrist Blood Pressure Monitor which has been tested and validated time and again to ensure the highest level of efficiency. The most prominent feature is its Heart zone guidance by which the monitor has activated automatically once the wrist is at heart level thus eradicating the possibility of inaccurate readings. With an inbuilt Irregular Heartbeat Detector, the device can alert its user while the readings are being taken, and an irregular heartbeat pattern is detected. The device allows its user the storage of up to a 100 readings along with their time stamp and date. With a Cuff circumference fitting up to a wrist of 8.5 inches in diameter, the Omron BP652N 7 Series Wrist Blood Pressure Monitor meets very high levels of precision. Containing Blue and Orange indicator lights for the purpose of helping in guiding the user’s wrist to the same footing as their heart for ideal positioning. When the blue light turns on, the wrist is then at heart level, the monitor activates automatically making this device is not only reliable but also user-friendly. 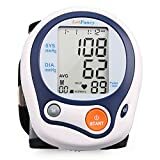 Omron BP652N 7 Series Wrist Blood Pressure Monitor silent and quick inflation allows its users to take readings anytime and anywhere without others noticing, and its slim design allows for hassle-free usage at home while traveling or in any setting. With the ever changing dynamics of the medical industry, it is important for users to keep up. The Wrist Blood Pressure Monitors are an easy and an effective way of keeping a constant check on Blood Pressure levels. They are ideal for those of whom find Upper Arm Blood Pressure monitors to be painful/ discomforting and have a large upper arm circumference. You might also want to read about nitrile rubber gloves.